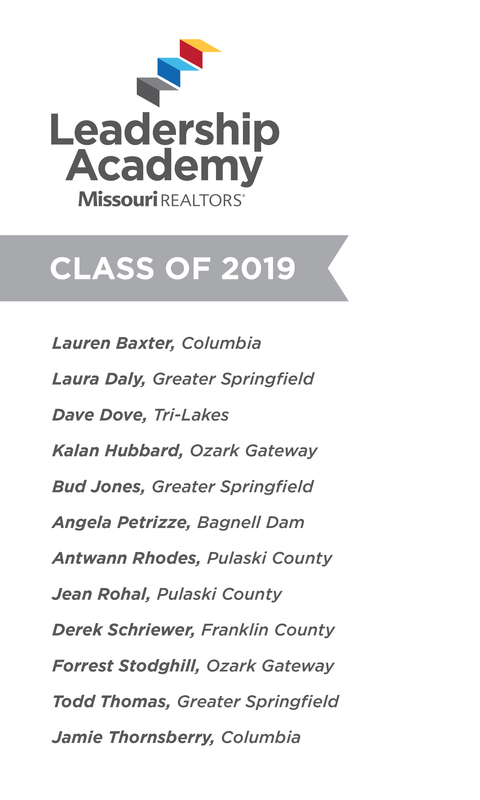 Recognizing that its members deserve leaders who are knowledgeable and well prepared, Missouri REALTORS® coordinates a statewide Leadership Academy. Through this program, Missouri REALTORS® trains emerging REALTOR® leaders so that they may exert a positive influence on the future of Missouri REALTORS®, their Local Boards/Associations and the industry. To identify Missouri REALTORS® who have demonstrated leadership potential and an interest in the REALTOR® organization, its history and goals. To train participants in leadership skills. To motivate participants by increasing their awareness of real estate and association management issues and challenges and involving them in problem-solving activities on issues of current interest. To develop a network of leaders across the state that will actively work for the continued growth of the REALTOR® organization at all levels. Participation in Leadership Academy is open to REALTORS® living in the state of Missouri. A maximum of 12 to 16 individuals will be selected to participate in the program. As space is limited, applicants who are not selected are encouraged to reapply in subsequent years. Participants will be selected based on their application, geographic location, gender and other considerations. These potential leaders will have knowledge of or be active in their Local Boards/Associations, and/or be active in real estate specialty areas, affiliated REALTOR® groups, community-based organizations or other volunteer organizations. All members of the Missouri REALTORS® are eligible to apply to the Leadership Academy. Application forms should include as much information as possible; however, answers should be limited to the space available. The application must be signed by both the applicant and the applicant’s employer (unless applicant is self-employed). The $75 application fee will be refunded if the applicant is not admitted. If the applicant is admitted, it will be applied to the cost of tuition. The applicant’s Local Board/Association President or Association Executive will be asked to co-sign the application. The application deadline for the 2019-2020 class is April 5, 2019. The Missouri REALTORS® Leadership Academy creates leaders who go on to do big things - in our industry and within our communities. These are a few words participants use to describe their experience. Will this be your year? Following get-acquainted ice breakers, the leadership class will experience amazingly accurate communication-style assessment process, identify their personal strengths and gain tips about how to work as a productive team. A dynamic speaker will present a unique view of leadership and teamwork. The group will get an introduction to team building and hold their first brainstorming session. By the close of the retreat, the participants will have a clearer understanding of the REALTOR® organization and the concept of leadership. Dynamic speakers will address effective communication, conflict resolution, media spokesperson training and working with other members. More team building and brainstorming will occur as leaders learn to make decisions and effectively communicate with one another. In addition to Leadership Academy sessions, the class will participate in Missouri REALTORS® Capitol Conference and experience the Missouri REALTORS® O2 process. Highlights will include presentations about political issues that are affecting the real estate industry, Capitol visits and Missouri REALTORS® Capitol Conference reception. The class will attend state output group meetings and continue teambuilding activities. The class will examine ethical decision making through a series of engaging exercises. There will be a discussion about ethical decisions REALTORS® must make in their profession and as volunteers. Other topics of current interest in the real estate industry will be discussed as well as team building exercises that enhance ethical decisions. The final retreat will be held during the Missouri REALTORS® September Business Conference. It will include a wrap-up, debriefing of the journey, motivational speeches and a graduation ceremony. The class will evaluate their experience and share key insights with each other and members. The Leadership Academy scholarship fund assists participants with program tuition expenses. If you would like to contribute to the Leadership Academy scholarship fund you can make a donation today. Your gift helps Missouri REALTORS® train more leaders and create a better future for our industry and our members. Download the and fill out the donation form. Attendance at all five Leadership Academy retreats is mandatory. Those who fail to attend will be asked to withdraw, with no refund of tuition. Note: Program tuition is based on double-room occupancy. This is a budgetary consideration and promotes the teamwork that is an integral part of the program. If a participant has a specific need that precludes sharing a room or simply prefers single room accommodations, he or she will be responsible for paying the entire cost of the room, not just the differential between a single and a double room.